Today, I am sharing with you a delicious Mediterranean eggplant recipe that tastes amazing and would make any eggplant hater into an eggplant lover. 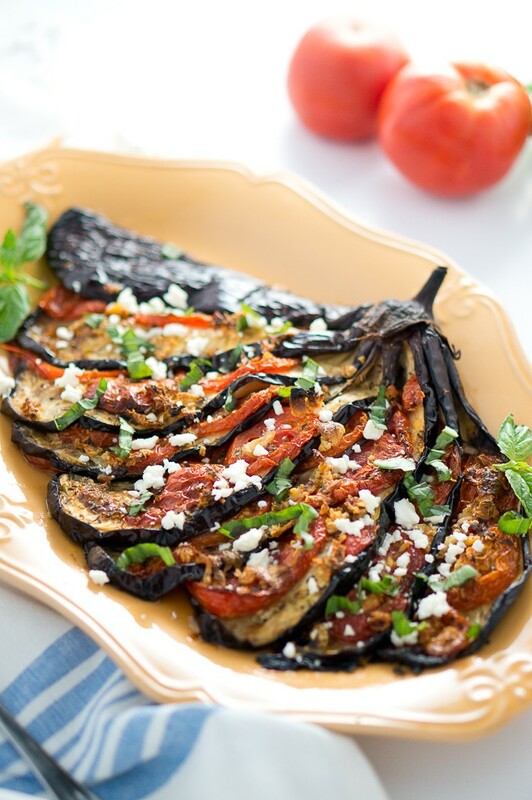 Roasted eggplant fan with tomatoes and feta cheese. My Mom made this roasted eggplant fan while she was visiting us last year, and finally, I am sharing the recipe with you guys. I am sure you will love it! Growing up, we were used to eating a lot of eggplant during the eggplant season. It’s definitely a common ingredient in our Mediterranean cuisine. I love eggplant based meals! If you want to have a delicious eggplant meal, you have to know some simple tricks. My grandmother taught me that the secret to the best tasting eggplant is to generously salt it and let it drain for an hour before cooking it. Unless you pick the eggplant fresh from your garden, you need to salt it and let all the liquid drain from the eggplant because the older and bigger the eggplant, the more likely it is to taste bitter and become soggy in the pan. Here is how to fix that. Cut the eggplant according to your recipe instructions. Salt generously (at least 1/2 Tbsp salt) and place it in a colander over a bowl or in the sink. If sliced into rounds, lay them flat on a baking sheet over a few paper towels, and tilt one side of the baking sheet so the liquid drains on the other side of the baking sheet. The salt will help to draw the bitter liquid out from the eggplant while simultaneously seasoning the eggplant from the inside out. It also helps the eggplant pieces become tender during cooking instead of becoming soggy. Grease each eggplant slice with olive oil, season with salt and black pepper. Place the eggplant on a parchment paper-lined baking pan. Bake for about 40 – 45 minutes. Preheat oven to 350 F. Rinse the eggplant and pat dry with paper towel. Cut the eggplant into thin slices, but not all the way through, leave it attached to the stem. Season every slice on both sides generously with salt, and lay them flat on a baking sheet over a few layers of paper towels. Slightly tilt one side of the baking dish and prop it with an object so the side is lifted by 1-2 inches off the counter. That way the liquid from the eggplant will go to the other side of the baking sheet. Let the eggplant sit for 1/2 to 1 hour. Rinse with cold water, pat dry and place on a clean baking sheet lined with parchment paper. Grease each eggplant slice with olive oil, season with salt and black pepper. Place the eggplant on a parchment paper-lined baking pan.Place couple of tomato slices between each eggplant slice, sprinkle some minced garlic and chopped fresh basil. Repeat with the remainder of the eggplant slices. Drizzle with more oil. Bake for about 45 minutes. If there is liquid in the baking sheet, continue baking for another 15 minutes, or until liquid has evaporated. The length of baking will depend on the size of the eggplant. When done, sprinkle with crumbled feta cheese on top and serve warm. 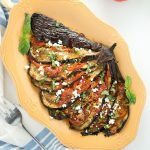 Roasted Eggplant Fan - This is a delicious Mediterranean eggplant recipe that tastes amazing and would make any eggplant hater into an eggplant lover. Preheat oven to 350 F. Rinse the eggplant and pat dry with paper towel. Cut the eggplant into thin slices, but not all the way through, leave it attached to the stem. Season every slice on both sides generously with salt, and lay them flat on a baking sheet over a few layers of paper towels. Slightly tilt one side of the baking dish and <g class="gr_ gr_16480 gr-alert gr_spell ContextualSpelling" id="16480" data-gr-id="16480">prop</g> it with an object so the side is lifted by 1-2 inches off the counter. That way the liquid from the eggplant will go to the other side of the baking sheet. Let the eggplant sit for 1/2 to 1 hour. Rinse with cold water, pat dry and place on a clean baking sheet lined with parchment paper. Bake for 45 minutes. If there is liquid in the baking sheet, continue baking for another 15 minutes, or until liquid has evaporated. The length of baking will depend on the size of the eggplant. I have been looking for an eggplant recipe and this looks delicious! I am definitely trying it! Thank you! Thank you, Beverley! 🙂 I am so glad to hear that this recipe is an inspiration for you. Roasted eggplant tastes amazing, and I am sure you will love this recipe! The garlic & tomatoes make it even better. Enjoy! I love eggplant as well, and will definitely try this recipe. Pinned to remember! I read a lot of different opinions, including side by side experiments, regarding salting vs not salting eggplant. My conclusion was that it is one of those things that you grew up with and do it out of tradition. I sometimes salt my eggplant and sometimes skip this step, I have never noticed any bitterness. I also found that microwaving it for a few minutes prior to cooking make sit absorb less oil. I have a recipe for eggplant and sausage casserole on my blog where I used this technique. I microwave a whole eggplant before cutting it. Love your blog, look forward to exploring it! Would love tips to cut all slices thinly and evenly… I really messed up the cutting! Looks like a very nice recipe. Will definitely try it!